on the part of man, holiness (1 John 1:6), obedience (1 John 2:3), purity (1 John 3:3), faith (1 John 3:23; 4:3; 5:5), and love (1 John 2:7,8; 3:14; 4:7; 5:1). John, Second Epistle of: is addressed to "the elect lady," and closes with the words, "The children of thy elect sister greet thee;" but some would read instead of "lady" the proper name Kyria. Of the thirteen verses composing this epistle seven are in the First Epistle. The person addressed is commended for her piety, and is warned against false teachers. 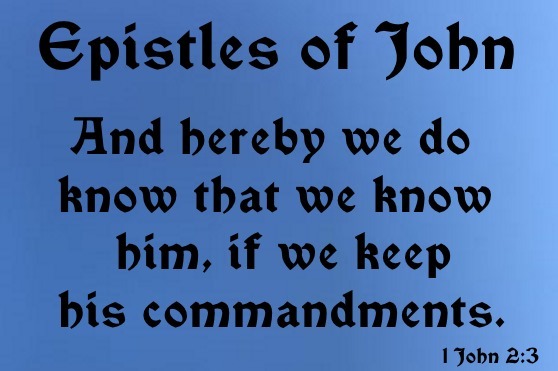 John, Third Epistle of: is addressed to Caius, or Gaius, but whether to the Christian of that name in Macedonia (Acts 19:29) or in Corinth (Romans 16:23) or in Derbe (Acts 20:4) is uncertain. It was written for the purpose of commending to Gaius some Christians who were strangers in the place where he lived, and who had gone thither for the purpose of preaching the gospel (Acts 20:7).